This pattern has been redesigned and now comes with a full video tutorial. Click here for the new pattern. You can still use the pattern below but keep in mind this pattern has been retired and will not receive pattern support if needed. Please use the revised pattern that comes with a video tutorial. Special notes: I worked in continuous rounds with a 3.75mm hook and worsted weight yarn, medium #4. Have any questions or if you come across a mistake in the pattern please leave a message in the comment section below. 14) 1sc then finish off leaving a long tail to weave along the edge with. Once I weaved the tail along the edge, I held the tip of the ear with my fingers while I tugged on the yarn tail a bit to give the ear some shape. I had to straighten out the tip while I kept working at it. When I was happy with the shape I knotted the tail off at the base of the ear to keep that shape. You could also make an inside for the ear by making a slightly smaller shape of a different color and sewing that to the inside of the ear. The face part is up to you. I used safety eyes for mine and also embroidered the nose and mouth in with crochet thread #10. But you could use a number of different things for the face from buttons to felt. The choices are endless. Just keep in mind choking hazards when giving the doll to a small child. And that's it. 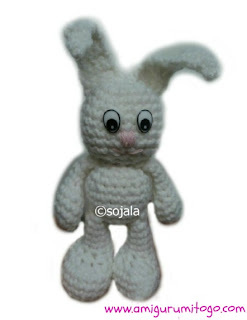 I hope you get your Little Bigfoot Bunny made and I hope you love him or her just like I do! See the rest of my Little Bigfoot Collection listed on the right side of this page. Sharon, what an adorable bunny, I'm currently working on another bunny pattern, but have put that on the side while I work on Coraline, and my pattern testing project. 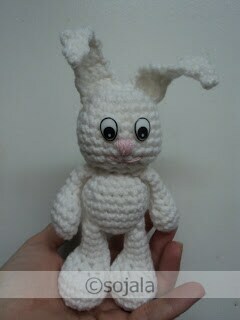 I'll be sure to add this amigurumi bunny to my list too. I believe I'll embroider the eyes. With my excess amigurumi, I'm saving them, and will distribute them this Christmas through one of my church's ministries. The amigurumi toys will be stocking stuffers, and I'll add a few more items. Eventually I'll need to add myself to the equation and make something for myself. I enjoy sharing with others. Opal, always so wonderful to read your messages! I have by complete accident designed the Bigfoot collection. I started with a tiny elephant I designed with crochet thread and felt it would be wonderful made bigger so my daughter could hug it, lol and so I did that and the rest of the characters began to emerge in my mind as I went along. Funny how these things happen! Very cute, thanks for the share! Thanks Cj, if you're on facebook stop by my page, Amigurumi Freely and post pictures of yours when you make them. I would luv to see! Thank you for the Little Big Foot patterns. I've made two of them, so far, and they're wonderful. They're whimsical and endearing. You've done such a wonderful job. I'm now marking your blogspot as one of my favorites. I am adding a tail and a slightly smaller nose to the Little Bigfoot Bear, you'll see a new post tonight and also a revision on the Bear pattern itself so watch for those! I was just wondering how old do u think a person could be to do these patterns?O and u should make a small pom pom and us it for the bunnys tail. It will make it look cute. Hello there! They are, what I would call easy amigurumi but for someone who knows the basics of sewing them together and all that. I'm not sure I could say for sure what age a person should be because it depends on how well they can pick up the basics of crochet. I should say this pattern would be easy for an advanced beginner. I hope that helps! New to Amigurumi. Is there a certain weight yarn that needs to be used? Thank you so much for sharing them!!! So glad to hear that and you're very welcome! Thank you so much for providing a "printer friendly" option!! And for the free patterns! I am a beginner and totally enjoying this new craft item.